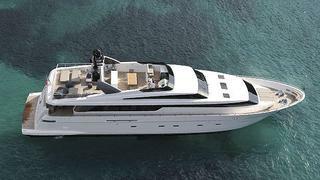 Kurt Lehmann at Yacht Moments sends news of a €1 million price drop on the 31.7m motor yacht SL104. Built by Sanlorenzo in 2012, this sleek beauty sleeps eight guests in four staterooms while twin 2400hp MTU engines give her a cruising speed of 25 knots. The SL104 is now asking €6,950,000.